Steve Meredith has spent more than 20 years in broadcasting and became the fifth host of Drive Time in 2015. 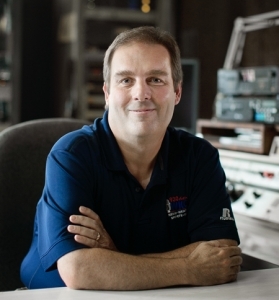 Throughout his career, he has focused on serving the community and giving people, groups and organizations a platform to help get their messages to the listeners. Within his first year in radio, he was humbled to be awarded special recognition from the United States Air Force for working with them on outreach. Steve is on the board of directors for Stuff The Bus, an effort to bring school supplies to children in need that he helped start in 2006. He’s also proud to have been a part of our sister station WDNS-FM’s winning the National Association of Broadcasters Crystal Award for community service. Steve grew up in neighboring Edmonson County, attended WKU and is married to Naren Meredith, with two sons. He feels blessed to have such incredible family, friends and co-workers.